I think we can all agree that spring is here or just about here. This is such a great time of the year with all the fresh foods and greens that are popping up in the local food and farmers markets. Food magazines are parading the newest trends with the most interesting ingredient or freshest veggie or herb. Yesterday, I saw Massaman Peanut Butter cookies by whimsyandspice.com in an advertisement in the April 2014 edition of "Food and Wine" magazine. In the caption the cookies were described as a peanut butter sandwich cookie made with 10 different spices inspired by traditional Thai curries. Well, peanuts are used as garnish and delicious in curries, I thought to myself, this has got to be good. After glancing at the ingredient list, it appeared to me that these were like peanut butter sandwich cookies with several warming spices in them. So I decided to bake a regular peanut butter cookie and add garam masala for the spice. Depending on which one you buy, it could or could not have many of the listed ingredients, mine was purchased from the World Market. The advertised presentation looked so much nicer than mine, but man, did these still turn out pretty darn good. Preheat oven to 350F. Prepare cookie sheet, grease with butter or spray or use silpat. In a medium sized bowl whisk all dry ingredients together, including the garam masala. Using a stand mixer, add butter, peanut butter and sugars, beat on high speed about 2 minutes, mixture should be slightly fluffy. Add vanilla and egg and mix until combined. Then add dry ingredients and blend until just incorporated. Using a regular size spoon, heap a rounded spoonful of dough, and place on cookie sheet, and before placing in oven, use the back of a fork to mash down. Bake 10 to 14 minutes, turning cookie sheet at halfway point. Let cookies cool completely on rack. Makes a little oven 2 dozen cookies. 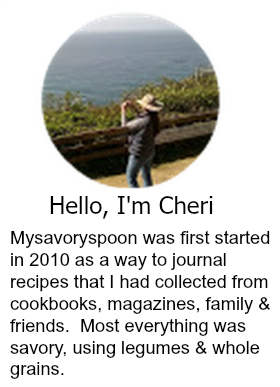 Mysavoryspoon was first started in 2010 as a way to journal recipes that I had collected from cookbooks, magazines, family and friends. Most everything was savory, using legumes and whole grains. Along the way I discovered a love for baking. Now a couple times a month you might see some type of sweet pie or treat. This is fascinating - would have never thought to add Garam Masala but I am intrigued! Hi Tricia, they add a whole new spice to the mix and it goes well together. Oooh, I bet the flavors in this are amazing! Never met a peanut butter cookie I didn't like! What a fun idea!! 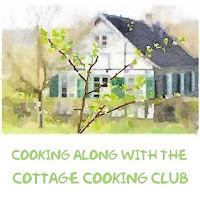 Kathi over at Deliciously Yum just posted some cookies with thyme in them...maybe this is the new thing! Savory cookies. Yum. Hi Karen, I have to go check them out, thanks! Yummy. Looks amazing. I know someone who would love these. Mmmmm, I LOVE garam masala. I'm so intrigued - these sound great! Hi Em, they are pretty good. Thanks for stopping by. Hi Tandy, I've never really done this before, but thanks. What an awesome idea, Cheri! Hi Crystal, appreciate the comment, thanks for stopping by. I love the idea of adding these crazy spices to the cookie mix! It's such a nice spin on the PB cookie! Thanks Joanne. have a great week-end! What interesting cookies! I love the flavor combination a lot. Thanks Maureen, they are pretty good. Very original! Those cookies must taste really wonderful. I love that idea. Thanks Rosa, they were delicious. I would never think to add garam masala to peanut butter cookies, but now I want to try it! I love peanut butter and I think the spices would make a good pairing with the peanut butter. Yum! Thanks Tammy, they are pretty good. This garam masala/peanut butter combo sounds ike somthing I'd really enjoy! What a brilliant idea - these look so great! Your cookies look delicious, never thought of adding Garam Masala. Love when the peanut butter cookies are soft in the center! Hi Michael, checked out your site, very, very nice! That is a really interesting flavour combination I will have to give it a try! Thanks, there is a little punch of heat at the end from spice, but in a good way. Have a nice week-end! What a unique cookie! I love the flavor twist with garam masala! Very different and I bet delicious too. Thanks Reeni, they were delicious! This is a great idea, your cookies look delicious, Cheri! Thank you Meike, appreciate it! Sign up with your email address to receive new updates straight in your inbox. Bourbon Glazed Fruitcake Bars and Happy Holidays! Copyright © 2010 mysavoryspoon. All Rights Reserved.